The words of Alfred Delp that “God’s power accompanies us on all our ways” marked Sister Maria Winfried’s life and helped her to trust in God and in life. The family experienced the burden of the war in two ways: The Polish hated them as Germans and the National Socialists despised and persecuted them as non-conformists and faithful Catholics. The mother died at the age of 52 due to ill-treatment, the eldest brother was killed in the Netherlands in 1944, and the youngest brother was recruited for labor in the last weeks of the war at the age of 15. The three young women were captured by the Russians and the Polish, but they were able to flee. On a dangerous across country journey, they walked about 360 km until they came to Berlin and from there to the Oldenburger Land. There they were reunited with their brother and other relatives. Ruth and one of her sisters were kindly accommodated and employed by the Sisters of Notre Dame in Lohne and Vechta. 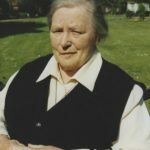 Marked by suffering and the grief over the loss of their parents and their home town, but deeply rooted in faith in the good and merciful God, Ruth began her postulancy in Mülhausen on January 30, 1948, putting her future life as a Sister of Notre Dame under the protection of God. 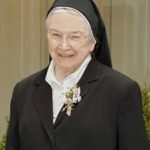 From 1952 to 1954, she was trained as a nurse at the Johannes-Hospital in Duisburg and from 1957 to 1998, she ministered as nurse and local superior in different convents of Maria-Regina Province, Mülhausen. She lived and worked most of the time at the hospital of Vinzenzheim in Aachen and in the nursing home Maria Einsiedeln in Bonn. In 2007, old age and sickness put an end to her active working life and led to her well-deserved retirement, first in Josefshaus in Bonn and then in Haus Salus in Mülhausen. 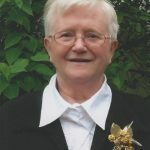 Sr. M. Winfried was a quiet woman of prayer who drew her strength from deep sources, who loved her community, and who could be very humorous. She gratefully accepted the service and care of her co-sisters and the nursing staff and she patiently bore the burden of her long-term care. She felt closely connected to her family and was happy about all the contacts and visitors. In the afternoon of January 10, God’s power accompanied her on her last way, leading her quietly into eternal life. 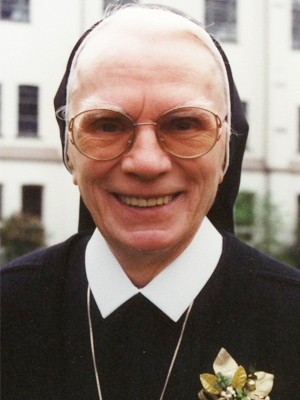 We thank Sr. M. Winfried for her unshakable faith in God who has given her the courage to live in all her suffering.